One of my friends from Minneapolis is from the southern part of the US. She hated okra since the only way she was used to eating it is in the form of gumbo. I had her try the way I cooked it (as outlined in the recipe below) and she loved it. She was surprised that it was not slimy. Okra is one of my favorite vegetable but I do not like it’s slimy texture either. How do you get rid of the sliminess when cooking okra? The most important thing to do is to dry it really well after washing it wipe with a damp cloth or paper towel. The next step is to cook it in the pan before adding any other vegetables or spices other than onion. Cook it till it starts to brown a little. Once that is done, then add spices and tomatoes etc. 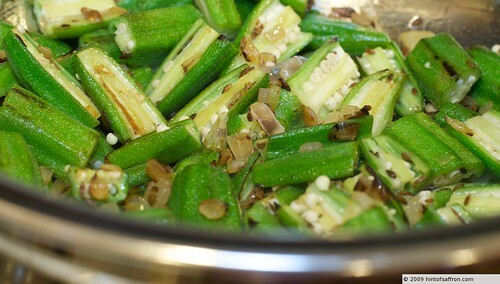 There are also recipes that are made by frying the okra in oil. I prefer not to fry okra since it soaks up a lot of oil and the dish comes out really oily. I believe that is how you will find them in the Indian restaurants. Okra cut on both ends. 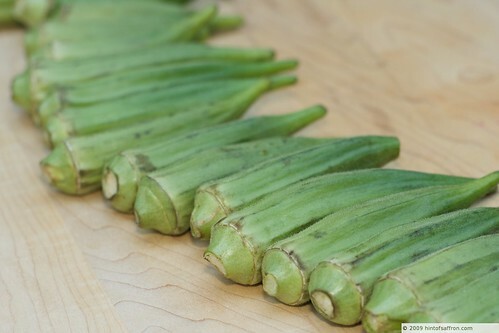 When my mom used to shop for okra, she would twist the thinner end of the okra. If the end broke off easily (instead of just bending like rubber), then that’s the piece she chose. That was a trick I apply when shopping for okra. Also, make sure to select slimmer pieces of okra. If not, I noticed that the okra is hard to chew since it does not cook well and also comes out tasting like rubber! Trust me, you will never like okra again if you do not already. Are you ready to make some tasty okra? Trust me, if you hate okra, try it this way and I will guarantee you will like it. Okra beginning to brown along with the onions. 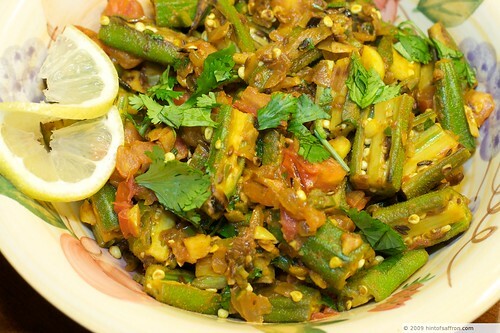 This recipe consists of okra that is slightly crunchy. The key to getting a crunchy texture is to wipe with a damp paper towel after cleaning them. After it dries, then cut the okra. 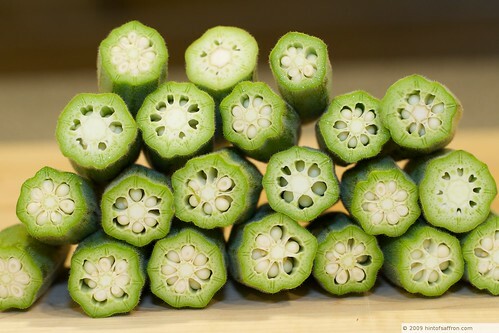 Cut the ends of the okra. Then slice it in half lengthwise and then cut them into 1 inch pieces. Along with the spices and caramelized onion, the okra turns out nice and crunchy and not slimy. Heat oil in a non-stick pan on medium heat. Add the cumin seeds and let it sizzle for 10-15 seconds. Add onions and fry for 2-3 minutes. Add okra and fry for 10-15 minutes until it starts browning. In the process of cooing the okra, the onions will have caramelized too. That is, the onions would have a developed a nice dark, brown rich color. Make sure to stir the mixture every so often so it does not burn. If the mixture starts to burn, reduce the heat. Add garlic and green chilies and fry for a minute or so. Add coriander powder, turmeric powder, chili powder and salt and stir for 1-2 minutes. Add tomatoes and stir fry for 2-3 minutes. Squeeze the juice of half a lemon and stir the mixture. Sprinkle with cilantro and serve with chappati or roti or naan.